An executive from Electronic Arts admitted that the reboot of Medal of Honor wasn't quite up to snuff. It seems like only yesterday that EA was saying that Medal of Honor would outdo Activision's Call of Duty. Now that the initial numbers are in and the critics have spoken, EA is changing its tune. 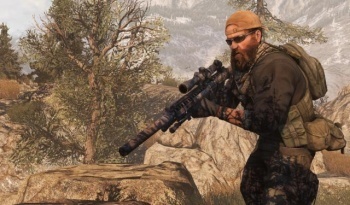 Patrick Soderlund, a VP at EA, admitted that Medal of Honor didn't quite live up to its expectations, but did say that the reviews so far are judging the shooter set in Afghanistan a bit harshly and that he is "proud" of the game. "The game didn't meet our quality expectations. In order to be successful in that space, we're going to have to have a game that is really, really strong," Soderlund said. "Medal of Honor is to some extent judged harsher than it should be. The game is better than today's reviews are indicating." When Soderlund was asked what review score he would give to MoH if had to, he balked. "I'm not going to say a specific number. I'm proud of what the game is and proud of what the team did. I just think the market is obviously telling us they think the game is X. We need to convince the market we can make something they appreciate more, particularly to be able to compete." EA is paying close attention to the consumer and critical response. "We're looking at that clearly. We're taking that seriously. I'm not at all saying Medal of Honor is a failure. It is a successful reboot of that franchise. We're going to be strong in the future." Soderlund said that the Studio that made the single-player portion of MoH, Danger Close, is working on another game but couldn't hint at what it might be. So it looks like EA doesn't think that MoH was a home run by any stretch, but they are looking at how to improve any and all future iterations of the series.